Dr. Beland is a Clinical Fellow, Abdominal Imaging Section, Department of Radiology, Massachusetts General Hospital, Boston, MA. Dr. Dupuy is a Professor, Department of Diagnostic Imaging, Brown Medical School and Director of Tumor Ablation, Rhode Island Hospital, Providence, RI. Author disclosure: Dr. Dupuy has received grant support and honoraria from Valleylab, a division of Tyco Healthcare Group LP, Boulder, CO. In 2005, an estimated 172,570 new cases of lung cancer were diagnosed in the United States alone, and a staggering 1.2 million new cases are diagnosed worldwide each year. 1,2 The lung cancer mortality rate far surpasses the mortality rates of colon, breast, and prostate cancers combined--163,510 people are expected to die of lung cancer this year in the United States. 1 The current overall 5-year survival rate for primary lung cancer is 15%. Given the suboptimal current treatment outcomes, alternative therapies are being sought. Percutaneous image-guided radiofrequency ablation (RFA) has been used in a variety of applications to treat solid tumors in the liver, kidney, breast, bone, and adrenal gland. 7-11 Lung RFA was first described in an animal model in 1995, 12 and multiple groups have reported their experience in humans since 2000. 13-20 Radiofrequency ablation has shown promise as a safe, minimally invasive technique that may play a complimentary role or even replace existing therapies in some patients with lung cancer. 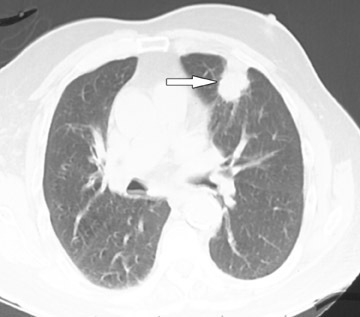 The mechanism, technique, and imaging features of pulmonary RFA will be reviewed here. Tissue heating is achieved in RFA through the conversion of an electric current in the frequency of radio waves (460 to 480 KHz) into heat by electron-molecular collision. The tissue heats by resistive energy loss,which is also known as frictional heating . 21,22 The goal is to heat tissue to 50˚C to 100˚C, which is considered lethal to target tissues. 11 An insulated RF electrode with an exposed conductive tip is placed into the target tissue. The electrode is connected to an RF generator. There is also a reference electrode (most commonly a grounding pad) that is placed on the patient's skin in an area of good electrical conductivity, generally on the thigh or the opposite chest wall. Patients referred to our institution for lung RFA are evaluated clinically by a nurse practitioner and a radiologist with experience in RFA. A thorough history and physical examination are performed, and the imaging and laboratory studies are reviewed. Treatment options are discussed with the patient, and a plan is made in conjunction with the referring physician. All patients are asked to fast overnight before the procedure. Upon arrival on the day of the procedure, patients are evaluated by the nursing staff, and a focused history and a physical examination are performed. Intravenous access is obtained, and repeat laboratory specimens are drawn if necessary. Patients are then brought to the computed tomography (CT) suite. Most RFA procedures are performed with the patients under conscious sedation following administration of midazolam and fentanyl by the radiology department nursing staff. The ground ing pad(s) are placed by support staff, and an initial scout image is obtained. The appropriate cranial-caudal level is chosen, and a computer grid is applied to the image. The skin entry site is chosen and measured in reference to the computer grid. This entry site is marked on the patient using laser lights projected onto the patient from the gantry. The area is then prepped and draped in sterile fashion, and 1% buffered lidocaine is used for local anesthesia. Superficial anesthesia is administered with a 25-gauge needle, and a 22-gauge spinal needle is used for deeper infiltration, including administration of a generous amount of anesthesia instilled along the superficial pleura. CT fluoroscopy is used to assess placement of the spinal needle and to plan trajectory of the RF electrode. Using CT fluoroscopic guidance, with the patient under controlled respiration, the electrode is then placed through the chest wall and pleura into the lesion. At our institution, we use an internally cooled, impedance-controlled and temperature-based RF electrode with a 200-W generator (Cosman Coagulator-1; Valleylab, Boulder, CO). The choice of the electrode length and the active tip length depends on the depth and size of the lesion. The electrode has an internal thermocouple that measures intralesional temperature. The electrode is also coupled to an infusion pump, which continuously infuses ice water to internally cool the electrode tip. Because the system is impedance-controlled, the wattage and current settings are automatically chosen by the system. Treatment times are between 4 and 12 minutes at a given position. Upon completion of a treatment cycle, the ice water infusion is stopped, and a maximal intratumoral temperature is measured through the electrode's thermocouple. 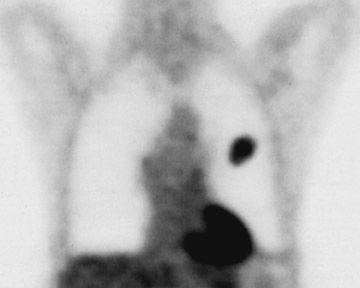 A maximal intratumoral temperature should be >60˚C to ensure that adequate coagulation necrosis has occurred. 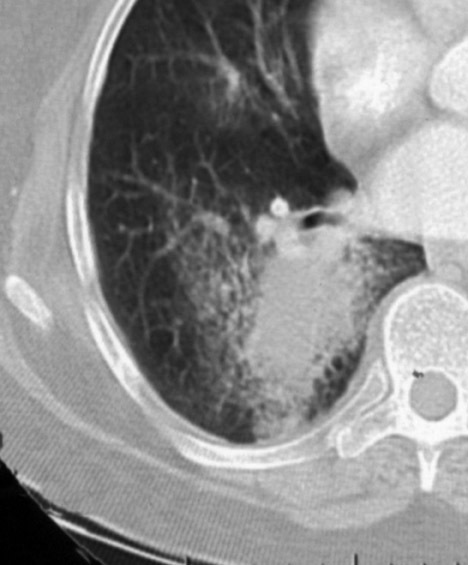 The electrode typically used in lung RFA may be a single-tip or cluster electrode (3 closely spaced electrodes), each a 17-gauge diameter. Thermocoagulation diameters of up to 3 to 5 cm can be obtained with the cluster electrode at full power. It has been shown that the higher impedance level of the surrounding lung tissue leads to more energy deposition in the tumor compared with tumors in other solid tissues. 23 Since this elevated impedance limits the amount of energy that can be delivered through a single electrode, we have found the cluster electrode more effective at heating, especially in small tumors. Upon completion of treatment, the electrode is removed and CT fluoroscopy is used to assess for pneumothorax and hemothorax. 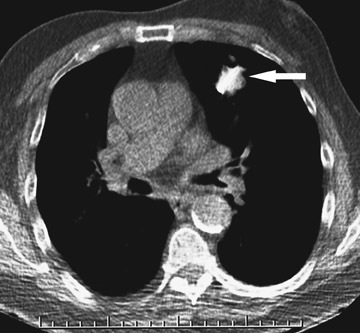 If a large pneumothorax or a symptomatic small pneumothorax is identified, evacuation can be performed immediately with a small-diameter drain-age catheter, and an immediate postprocedure chest radiograph can be obtained. All patients are observed for a minimum of 2 to 4 hours in our postprocedure recovery room. 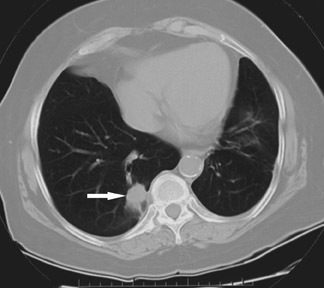 A repeat chest radiograph is obtained prior to discharge to confirm the absence of pneumothorax or the stability of a previously identified small pneumothorax. If a chest tube has been placed, a repeat chest radiograph is performed. 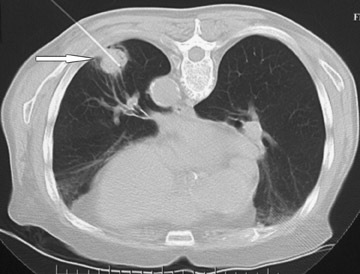 If the pneumothorax has decreased in size, patients are discharged with a one-way Heimlich valve attached to the chest tube, and they are scheduled to return to the department in 24 hours for a repeat chest radiograph and clinical evaluation. Chest tubes can usually be removed at this time. Occasionally, a persistent air leak occurs and requires prolonged catheter placement. We have also occasionally admitted patients for overnight observation for pain management or significant apprehension related to the chest tube. 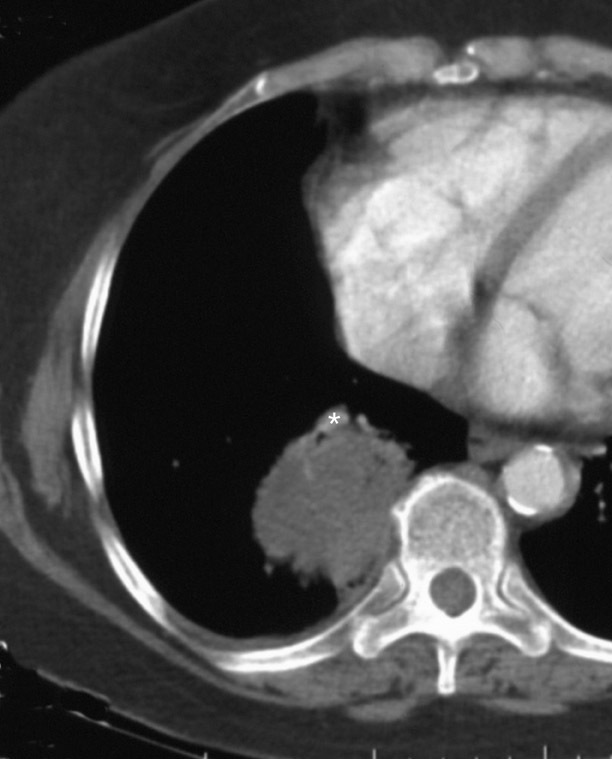 All patients are given 1-month follow-up appointments for chest CT without and with intravenous contrast. 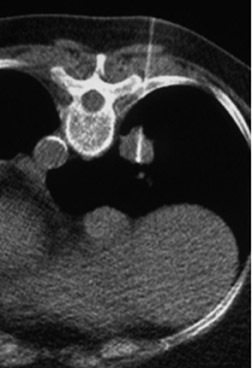 Changes in the CT appearance of the lesion are seen immediately during treatment (Figure 1). Most commonly, there is surrounding ground-glass parenchymal opacity. 12,20 Wrinkling of the edges, vaporization, and multiple surrounding concentric rings ("cockade phenomenon") have been described by Gadaleta and colleagues. 24 They also found that the tumor diameter did not change during treatment. At 1-month follow-up, the lesion may appear as an area of consolidation or nodularity. At this time, the mean lesion diameter will generally be larger than the preablation size. The increase in size should not be mistaken for tumor recurrence. There may also be cavitation and the appearance of "bubbly lucencies." 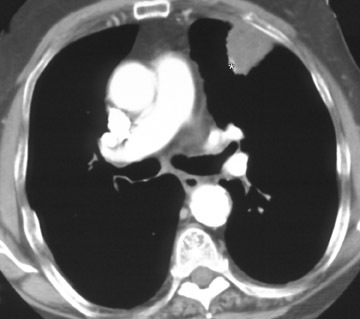 18- 20 Lung tumors that are successfully treated with RFA also show decreased contrast enhancement (Figure 2). Suh and colleagues 25 found marked decreases in contrast enhancement at 1 and 2 months postablation as compared with preablation enhancement levels using nodule CT densitometry. 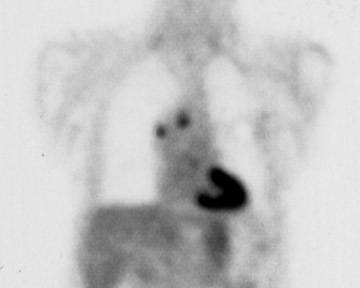 Positron emission tomography (PET) has also been shown to be useful in the follow-up evaluation of patients treated with lung RFA. Complete resolution of increased fluorode-oxyglucose (FDG) uptake on postablation PET has been shown by Akeboshi and colleagues 17 and has also occurred at the authors' institution (Figure 3). Residual or recurrent tumors will appear as an area of increased FDG uptake, usually at the periphery of the treated lesion. 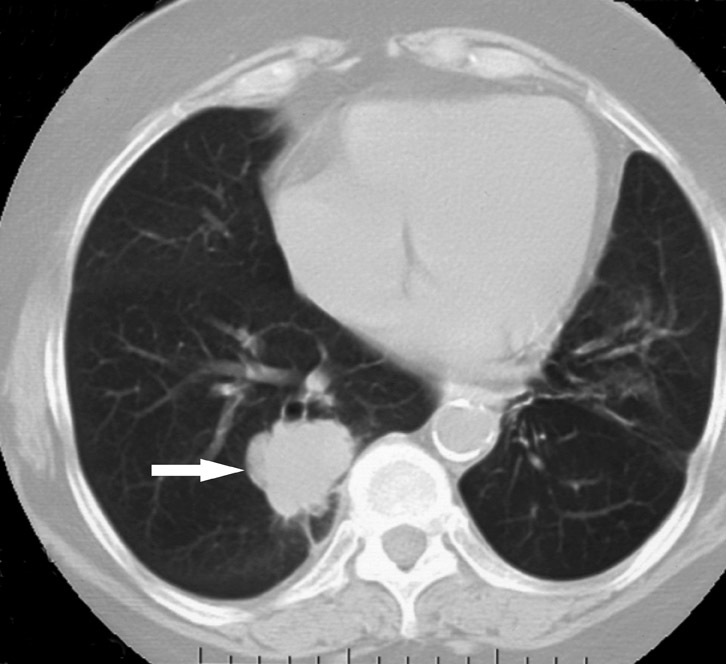 Lung cancer continues to have a high mortality rate, and the majority of patients diagnosed with primary lung cancer will not be surgical candidates. Radio-frequency ablation has been shown to be a safe and well-tolerated procedure. 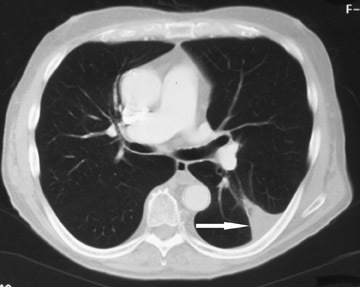 The unique conductive properties of lung tissue allow a high level of heat deposition into the tumor, and the RFA technique is, therefore, particularly well suited to application in the thorax. With continued experience and research, RFA can be expected to play a complementary role and potentially a primary role in the treatment of lung cancer. Current and future applications of percutaneous radiofrequency ablation in the treatment of lung neoplasms. Appl Radiol.